Recent genomic studies revealed a single gene regulating wing colour pattern polymorphism in ladybird beetles. 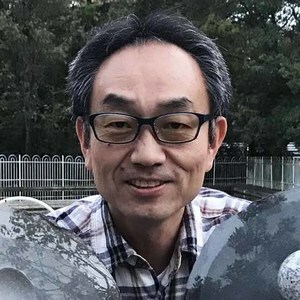 This paper is published in Nature Communications with coauthors Toshiya Ando, Takeshi Matsuda, Kumiko Goto, Kimiko Hara, Akinori Ito, Junya Hirata, Joichiro Yatomi, Rei Kajitani, Miki Okuno, Katsushi Yamaguchi, Masaaki Kobayashi, Tomoyuki Takano, Yohei Minakuchi, Masahide Seki, Yutaka Suzuki, Kentaro Yano, Takehiko Itoh, Shuji Shigenobu and Atsushi Toyoda. The paper in Nature Communications is available here. I have a long story to reach this paper. I am a molecular entomologist focusing on various charismatic traits that insects show. After I completed my PhD on diapause of the silkworm moth at Nagoya University in 1993, I decided to learn state-of-the-art genetic techniques by studying Drosophilain Walter Gehring’s lab at the University of Basel as a postdoc. The experiences of Drosophilagenetics at the Gehring lab had a great impact on my carrier as a scientist. Soon after I returned to Japan in 1997, I started to apply these techniques to non-model insects. I was especially interested in studying the genetic basis of colour pattern in the multicoloured Asian ladybird beetle, Harmonia axyridis, which plays the leading role in this paper. It shows extraordinary intraspecific variation in wing (elytral) colour patterns (more than 200 described colour forms; Fig. 1), and seemed to be the best model to elucidate how the diverse and interesting traits of insects are generated during evolution at the molecular level. Fig. 1 Wing colour pattern variations in Harmonia axyridis. They aggregate during overwintering. Studies of the genetics of wing colour-patterns of Harmonia began with preliminary crossing trials by a later geneticist of Drosophila virilis, Mitsushige Chino, in 1918. The evolutionary biologist, Theodosius Dobzhansky, also focused on diversity of the wing colour patterns in H.axyridis before he started Drosophila genetics in 1927. Successive intense crossing experiments were performed by a number of geneticists including Taku Komai, who introduced Drosophila genetics to Japan from Thomas Hunt Morgan’s laboratory in 1925, and a Chinese geneticist, Jiazhen Tan (also known as C. C. Tan) who was the first Ph.D. student of Dobzhansky in Morgan’s laboratory. By the end of the 1940s it was clear that the striking diversity of >200 forewing colour patterns arises from variation at a tightly linked genetic locus, h (named by Taku Komai), encompassing >20 alleles. I started studying the molecular genetics of ladybirds with my undergraduate student, Hisashi Kuwayama. Surprisingly, he succeeded in generating a transgenic ladybird beetle in just a few months1! Based on his technique, we have now built a suite of genetic tools for this non-model insect2-6. The advent of systemic RNAi induced by larval dsRNA injection dramatically facilitated genetic analysis in ladybird beetles7-9. Fortunately, my first small-scale RNAi screening focusing on 10 Drosophila wing pattern formation genes identified a transcription factor gene, pannier. When function of pannier was inhibited by RNAi, all black regions in ladybird forewings were transformed to red. This result clearly pinpointed pannier as a crucial regulatory factor for red/black colour patterning in the ladybird elytra. Although pannier seemed to play a pivotal role, we still did not know whether pannier was associated with the h locus. Our study reached a turning point when I moved to the National Institute for Basic Biology in 2015. 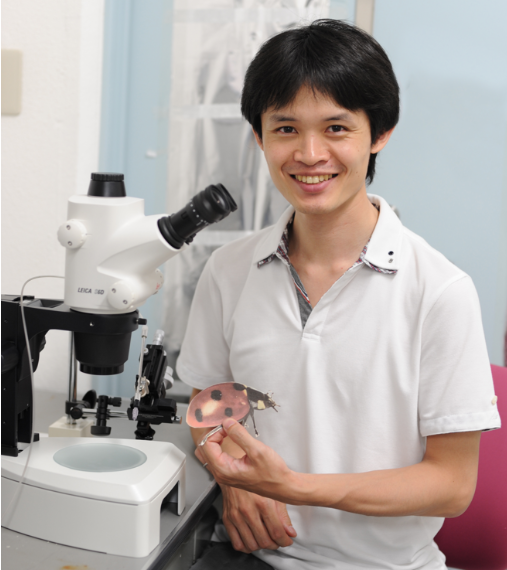 Toshiya Ando, who experienced genomics of a swallowtail butterfly and Drosophila genetics in his postdoctoral training, joined my laboratory (Fig. 2). He advanced genetics and genomics of H. axyridis, collaborating with additional genomics specialists. And, finally, we found that pannier is located at the h locus. Our genomics data suggested that the repeated inversions and cis-regulatory modifications within the first intron of pannier facilitated high diversification of wing colour patterns in H. axyridis. Fig. 2 Toshiya Ando at his microinjection system in Okazaki. It is intriguing that both the classical genetics and modern genomics of H. axyrids have been performed by researchers once involved in Drosophila genetics. Recent independent genetics and genomics studies on colour pattern polymorphisms in H. axyridis were also conducted in part by Drosophila geneticists10. Our future studies will focus on what kind of exact modifications at the pannier locus have generated the extraordinary variation of wing colour patterns. To this end, we are planning to initiate transgenesis and genome-editing works11 focusing on the pannier locus. We are also going to utilize cryopreservation techniques of ovaries in Harmonia12 to advance these projects efficiently. 1. Kuwayama, H., Yaginuma, T., Yamashita, O. and Niimi, T. (2006) Germ-line transformation and RNAi of the ladybird beetle,Harmonia axyridis. Insect Mol. Biol., 15, 507-512. 2. Hara, K., Kuwayama, H., Yaginuma, T. and Niimi, T. (2008) Establishment of a tetracycline-off system using a piggyBac-based vector as a gene functional analysis tool for the temporal targeting of gene expression.J. Insect Biotechnol. Sericol., 77, 159-166. 3. Hara, K., Kuwayama, H., Inukai, Y., Yaginuma, T. and Niimi, T. (2009) A novel fusion protein that functions as an enhanced green fluorescent protein reporter and a tetracycline-controlled transcriptional activator. Dev. Genes Evol.,219, 103-110. 4. Osanai-Futahashi, M., Ohde, T., Hirata, J., Uchino, K., Futahashi, R., Tamura, T., Niimi, T. and Sezutsu, H. (2012) A visible dominant marker for insect transgenesis. Nat. Commun., 3, 1295. 5. Kuwayama, H., Gotoh, H., Konishi, Y., Nishikawa, H.,Yaginuma, T.and Niimi, T. (2014)　Establishment of transgenic lines for jumpstarter method using a composite transposon vector in the ladybird beetle, Harmonia axyridis.PLoS ONE, 9, e100804. 6. Masumoto, M., Ohde, T., Shiomi, K.,Yaginuma, T.and Niimi, T. (2012) A baculovirus immediate-early gene, ie1, promoter drives efficient expression of a transgene in both Drosophila melanogasterand Bombyx mori. PLoS ONE, 7, e49323. 7. Niimi, T., Kuwayama, H. and Yaginuma, T. (2005) Larval RNAi applied to the analysis of postembryonic development in the ladybird beetle, Harmonia axyridis. J. Insect Biotechnol. Sericol., 74, 95-102. 8. Ohde, T., Masumoto, M., Morita-Miwa, M., Matsuura, H., Yoshioka, H., Yaginuma, T.and Niimi, T. (2009)Vestigial and scallopedin the ladybird beetle: a conserved function in wing development and a novel function in pupal ecdysis. Insect Mol. Biol., 18, 571-581. 9. Tsuji, T., Gotoh, H., Morita, S. Hirata, J., Minakuchi, Y., Yaginuma, T., Toyoda, A. and Niimi, T. (2018) Molecular characterization of eye pigmentation-related ABC transporter genes in the ladybird beetle Harmonia axyridis reveals striking gene duplication of the whitegene. Zool. Sci.,35, 260-267. 10. Gautier, M, et al. (2018) The genomic basis of color pattern polymorphism in the harlequin ladybird.Curr. Biol., 28, 1-7. 11. Hatakeyama, M., Yatomi, J., Sumitani, M., Takasu, Y., Sekiné, K., Niimi, T. and Sezutsu, H. (2015) Knockout of a transgene by transcription activator-like effector nucleases (TALENs) in the sawfly, Athalia rosae (Hymenoptera) and the ladybird beetle, Harmonia axyridis(Coleoptera). Insect Mol. Biol.,25,24-31. 12. Kawaguchi, H. and Niimi, T. (2018) A method for cryopreservation of ovaries of the ladybird beetle, Harmonia axyridis. J. Insect Biotechnol. Sericol., 87, 35-44. link.